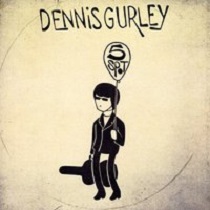 Dennis is a singer/songwriter from Missouri who’s clearly been influenced by The Beatles, The Byrds (dig that 12-string on opener “Every Other Summer”! ), Tom Petty, and, like his influences, delivers very catchy songs. His fourth release is a five song pop/folk/rock affair...with strong influences of the aforementioned Byrds, The Beatles, ditto Tom Petty - full of melody and catchy hooks...every song is a singalong. “The 12-string electric guitar and its airy jangle on ‘Every Other Summer’ signifies the psychedelic innocence and optimism refracted through the peculiar light of mid-'60s Los Angeles. Couple that with the Beatles' melodic energy and you’ve got yourself a pleasant little record! All the songs fit together extremely well, there's a great flow to the record.” – Max Humphries EXCELLENT! !